NI IKI GITERA ICYOREZO CYADUTSE MU RWANDA CYO KWIYAHURA NO KWICANA HAGATI Y’ABAVANDIMWE, ABANA N’ABABYEYI, ABASHAKANYE N’ABANDI BAFITANYE AMASANO? Twagerageje gushaka impamvu nyayo yaba itera icyo kibazo, turabasaba ababa bafite ibitekerezo ku mpamvu nyamukuru zaba zitera icyo cyorezo, kuzitugezaho n’abandi banyarwanda bakazimenya byaba ngombwa mukanatanga n’umuti mubona watuma icyo cyorezo gicika. Hano hasi nabashyiriyeho links/liens z’ibyagiye bitangazwa mu binyamakuru byo mu Rwanda kuri ibyo bikorwa:BITEYE UBWOBA! Ibi ni bimwe mu byamenyekanye, hari byinshi bitamenyekana kubera uburyo bwo kwica buba burimo amayeri menshi bigatuma hatagira umenya ko umuntu yishwe. Rero bavandimwe nimugire icyo muvuga kuri iki kibazo, munatange umuti watuma iki cyorezo gicika burundu kuko biteye ubwoba si ibintu bisanzwe. Rwanda Rwiza:You may start by introducing your selves to the Rwandan community and also explaining to them what RPRK is and what it is about, In brief you can tell us what the mission and objectives of RPRK are? RPRK :The abbreviation RPRK stands for Rwandese Protocol to Return the Kingdom, this organization has principal objectives of return the Rwandan Constitutional Monarchy as a current suitable governance system, the return of His Majesty King Kigeli V Ndahundurwa exiled in USA as the head of state, as well as the return of all the Rwandan refugees. You may ask yourself why returning the Kingdom ? it’s not only returning monarchism but the Constitutional Monarchy in which His Majesty King Kigeli V Ndahindurwa sworn in for. He announced that he would be the King that based on the constitutional on the 28th/07/1959 the day of burying his brother late King Mutara III Rudahigwa . On the 09/10/1959 before of the Vice Governor General of Rwanda and Burundi Mr Jean Paul Harroy and the Rwanda National Council, His Majesty King Kigeli V NDAHINDURWA was sworn in as a Constitutional King and signed –(reference –Rwanda de la feodalite ala democratie, 1955-1962 Jean Paul Harroy page 283). That is why RPRK don’t say the installing of monarchism based on the constitution monarchy but returning it because it was already in place. Rwanda Rwiza:In brief , is there anything you can tell us about His Majesty King Kigeli V Ndahindurwa? RPRK :His Majesty King Kigeli V Ndahindurwa is a son of late King YUHI IV Musinga, he was born in 1935. He was born in a family of 9 men, he was the only one who was selected to replace his elder brother King Mutara III Rudahigwa ,Since his childhood he is known as a calm, humble, social and someone who love his work. He left Rwanda after he had gone to meet the UN secretary general Mr Dag Hermmarz kjold at leopoldeville currently (Kinshasa) in congo. The Belgians blocked him from returning to Rwanda up to this day(1960-2011) he has been a refugee. He fled when he was the King of Rwanda and RPRK preparing his return still as the King of Rwanda. The republic and its arms of government or institutions were put in place on 28/01/1961; and that is what was called coup de etat of Gitarama, which was not recognized by the united nations (refer to UN resolution 1579,1580,1605), the referendum of 25/09/1961 was made in contradiction to the resolutions which mandated that it would be made only when His Majesty King Kigeli V NDAHINDURWA had returned and all Tutsi refugees back in their mother country, and those who committed atrocities would be given amnesty and finally the masses would decide whether they want constitution monarchy or the republic, which was not done. You will recall that the referendum was demanded by the colonialists but not Rwandans themselves . The only Rwandans who were partisan of parmehutu ,a party that wished to all Rwandans to be treated equal before the law, and before the King (refer to note, sur la manifestation des bahutu). His Majesty King Kigeli v Ndahindurwa who was sworn in as a Constitutional King is still the King of Rwanda. He has to return so that Rwandans can be reconciled and re united. Rwanda Rwiza:We know that King Kigeli V Ndahindurwa is elderly ,after his return,is there anyone that is prepared to be the King? In case he is no more. RPRK :Like it is in other countries with constitutional monarchies ,what RPRK is focusing on ,is the institution of monarchism, which is different from Absolute monarchism but in constitutional monarchism, the Kings and their succession would be according to the law and constitution like it is in other countries under Constitutional Monarchism like Holland, England , Norway, Denmark, Spain, Belgium, etc. You will realize that a part from morocco, Rwanda would be the first in Africa to have a monarchy that is based on the constitution. Rwanda Rwiza:You are saying that you wish to return monarchism in Rwanda , what means are you going to use to realize your goal ? because you remember President Kagame said that in case King Kigeli V Ndahindurwa wish to return to Rwanda, should come as a layman, civilian like anyone ordinary Rwandan. RPRK :His Majest King Kigeli V Ndahindurwa of Rwanda shall return as a head and the leader of the nation, like the majority of Rwandans desires, so it is not President Kagame to decide the return of His Majesty King Kigeli V NDAHINDURWA. Like in the republican regimes in Rwanda ,there has been a lot of bloodshed and no president has been able to unite the Rwandans to the extent that the Hutus,Twas,and Tutsis can live in harmony Indiscriminatively . The Hutus,Twas, and Tutsis are tired of the monkey tricks of the republican presidents and continuing to fleeing their country and seek refugee else were .the masses of people are working so hard to ensure that father of Hutu, Twa and Tusti His Majesty King Kigeli V Ndahindurwa return home, to reconcile and re-unite and settle their grievances and live together in peace. When President Kagame and RPF evaded the country in 1990 ,they pretended to use the return of King Kigeli V Ndahindurwa as their motive but the truth was that they had their selfish interests . After they had attained their selfish interests they kept the king and other citizens in exile because the return of the king is in the interest of all Rwandese ,the government of President Kagame and his accomplices are not comfortable with that. Rwanda Rwiza:It Has been said that the King has an army and so many people have been jailed and killed because of that how far is it true? We wish to remind you that, culturally, the King does not invade his own country, just like no one parent would burn a house where his children are, likewise, the King can not attack a nation knowing that his people in this case his children are in. Rwanda Rwiza:In brief, can you tell us how you see or find President Kagame’s leadership? RPRK:The leadership in Rwanda is nameless. It is a leadership that Kills and starves those its supposed to accord justice. It is leadership that composed of individuals who have their selfish interests. Who do not care about the citizens at large. We would compare President Paul Kagame to King Ludoviko XVI of France. He killed and does not protect the citizens. Among other presidents ,he is said to have killed millions of Rwandans. Let it be the hutus,twas,and the Tutsis since 1990 up to 1994 he killed hutus on the reason that they were merely hutus, On another occasion he killed thousands of Tutsis who were coming from Burundi ,Rwanda,and Congo who joined RPF – RPA struggle. on 04/02/1993 Kagame sent RPA Commandos who infiltrated and killed the Tutsis known as ABAGOGWE in Ruhengeri prefecture, who were in President Habyarimana’s territory on the pretex of finding a reason of carrying out an attack of the08/02/1993, but his intention of taking over power by force failed, because UN ordered RPF to pull back its forces to the previous battle positions. On the 6th/04/1994 President Kagame ordered the shooting down of airplane that was carrying President Habyarimana .He did that knowing very well that the hutu extremists would kill the tutsis on the sole reason that they are Tutsis. He killed Rwandans in Ruhengeri, Gisenyi up to the extent of Killing Congolese Tutsis known as Banyamurenge in Congo. They were killed in the name of being accomplices of the former regime before he crossed to Congo ,he killed the catholic priests and of cause Kagame’s atrocities are endless. Kagame participated in so many killings of various presidents like Habyarimana of Rwanda ,Ndadaye of Burundi, Sindikubwabo of Rwanda ,President Mobutu and President Laurent Desire Kabira of Congo , without forgetting President Pastor Bizimungu which he paralysed. At the same time, Rwanda has and continues to have the highest number of her nationals fleeing the country including those he has worked with. Rwanda Rwiza:What can you say about the issue of justice? About those who participated in the genocide? The soldiers who were in RPF who are suspected to have participated in the killings in Rwanda , Congo, etc. Those who continue to commit atrocities against those who are in opposition to the government together with other crimes of embezzlement? RPRK:There is no justice in Rwanda, RPRK does not value the courts of justice in Rwanda or even the (Gacaca courts) RPRK only believes in the justice that will prevail after the truth being established of the atrocities that were done against the Rwandans. The Tutsis are traumatized by the actions of their fellow countrymen. In the instance of Twas ,you can think that they are not recognized to be Rwandans. The Tutsis have wronged their fellow Tutsis ,we can speak of the Tutsis who attacked their country without considering their relatives who are in the country by then. They will be answerable one time at one point . The Tutsis killed their fellow Tutsis Major General Fred Rwigema because of their selfish interests. The Hutus killed their fellow Hutus ,The Bakigas and Banyenduga were against one another. Everyoneis supposed to be given a platform to express his/her converse. There should be a dialogue that does not discriminate anyone when it come to make a first system . RPRK believes that whoever committed crimes anywhere shall be answerable and those who were treated unfairly ,justice be accorded. Rwanda Rwiza:How do you see the issue of tribalism or ethnicity in your organization ? Do you see unity and reconciliation being possible to be reached? What advise can you give so that unity and reconciliation can be realized. RPRK:RPRK approves that there are three ethnic groups ,Twas ,Tutsis and Hutus and every individuals under one of these groups should feel proud of what she/he is notably , Tribes or ethnicity should not be a tool to terrorize or mistreat others but should be a tool of co-operative and compatibility. The whole truth of the matter ,Twas,Tutsis ,and Hutus became a political tool after the colonialists wrote this in the Rwanda national identity cards, At one time when you asked a Rwandan his/her ethnic group in his/her mind would not straight away think of Twa,Hutu,or Tutsi instead he/she would think of clan issues for example that he /she is Umusinga,Umuzigaba,Umwega,Umunyiginya etc, and these clans were shared by all the ethnic groups in Rwanda , and they liked these and would be respected in their cultural settings. RPRK believes that reconciliation and unity amongst the Rwandan is possible because all these ethinic groups a part from the extremists but even the extremists have become fed up of the atrocities that have been in Rwandan regime after regime. So it is within everyone’s interest to live in harmony and peace after reconciliation. Reconciliation is very possible because His Majesty King Kigeli V Ndahindurwa of Rwanda is not one sided but a parent and a leader of everyone, he can easily end the conflict between Hutus and Tutsis while make them seat on one table and settle all the issues concerning the atrocities occurred between them. Rwandans have faith in him , they want him to act as a referee in settling the grievances between the two brothers (HUTU and TUTSI). Those who wronged others will be punished or pardoned, afterwards, the country will concentrate on national development. In other wards unity and reconciliation is possible only after returning the Constitutional Monarchy in Rwanda and the returning back to Rwanda of His Majesty King Kigeli V NDAHINDURWA as the Head of State. Rwanda Rwiza:Does or has your organization signed any agreement with other organizations that would also wish to see King return? There are political parties or organizations that are anti-government ,are there any of those that you are collaborating with? RPRK:RPRK is not a political party first of all. We believe that the Rwandans wishes and desire and believe that constitutional monarchy as a governing system is a unique governance system which can enable all tribes of Rwanda to live in peace and united in permanent nature. All those who have the same believe can come and we reach our goals. We don’t refuse anyone and agreements are not necessary because the King belongs to all of us HUTU,TUTSI and TWA and he do not belong to any political party, he is above all political organizations. Constitutional monarchy is the only system that can see Rwandans in good governance based on the true democracy. Rwanda Rwiza:What kind of Rwanda do you wish for your children and grand children? what should we expect? RPRK: The Rwanda which we need to see is a sovereign nation with solid and working strong institutions other than having individuals or mafias to lead the country .The King of Rwanda will be the national head or leader but not a ruler, the King will be the Commander in Chief of the Army, there will be no any politician who will utilize the army in his individual benefits as it happened since the establishment of illegal republic in Rwanda . As a head of state, the King will be responsible for protecting the elected CONSTITUTION of Rwanda in order to avoid constant amendments which might occur due to the benefits of individual politicians. The constitutional monarchy is the only one that will install democracy, freedom of press and human rights in Rwanda. The King shall not belong to any political party therefore, people will be allowed to join political parties at their free will and free and fare elections will be held. Constitutional monarchy is the only system in Rwanda that would make every body free and no leader would be above the law, i.e. the powers of the head of state in this case the King, will be limited by what he is only entitled by the CONSTITUTION, similar to the head of the government, the prime minister. In other wards, the head of state in this case the King or the head of the government in this case the Prime Minister, no one will have absolute powers. Replacing leaders would be democratic without any bloodshed like it has been characterized by all the regimes in Rwandan republic, set up succession of the King would not be done by the “abiru” like it was done in the absolute monarchy system. The constitution will lay out the succession procedures . We wish/desire total peace, national development and governance where every one is part of. That is the Rwanda we are preparing for our children and grand children. Mu minsi ishize abantu benshi bumvise ikibazo kijyanye na Léon Mugesera. Uwo mugabo yoherejwe mu Rwanda n’igihugu cya Canada nyuma yo kwirukanwa muri icyo gihugu. Léon Mugesera yari yarageze mu gihugu cya Canada muri 1993, aciye mu gihugu cya Espagne. Guhera muri 1996 yatangiye kuburana ku kibazo kijyanye no kuguma mu gihugu cya Canada dore ko yari afite Ubwenegihugu bw’icyo gihugu ariko akabwamburwa kubera gukekwaho icyaha yo gukangurira abahutu kwica abatutsi mu ijambo yavugiye muri Mitingi y’ishyaka MRNDD yabereye ku Kabaya mu Ugushyingo 1992. 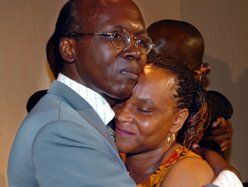 Nyuma yo kwirara agakeka ko atazoherezwa mu Rwanda, urukiko rw’ikirenga rwa Canada rwamuhakaniye burundu muri 2005. Akomeza kujurira ariko biranga kugeza ku munota wa nyuma yiyambaje Akanama k’umuryango w’abibumbye karwanya iyica rubozo (Comité des Nations unies contre la torture) yavugaga ko nasubizwa mu Rwanda azakorerwa iyicwa rubozo. Urukiko rwo muri Canada rwafashe umwanya wo kwiga ku buremere bw’ibyemezo by’ako kanama ariko busanga ibyo bitabuza iyoherezwa rya Léon Mugesera mu Rwanda. Hagati aho ariko Léon Mugesera yajyanywe mu bitaro, hari amakuru avuga ko ngo yashatse kwiyahura akoresheje imiti ariko ayo makuru nta gihamya afite. Byabaye iby’ubusa kuko Léon Mugesera yashyize akagezwa i Kigali n’abategetsi ba Canada mu ndege yari yakodeshejwe kubera iyo mpamvu. Ariko abantu benshi bibajije impamvu Léon Mugesera atigeze aburanishwa n’igihugu cya Canada nk’uko cyabikoreye abandi banyarwanda bafatiweyo bakekwaho ibyaha bijyanye na Génocide. Ibi byatumye ducukumbura twibaza impamvu nyamukuru yatumye ikibazo cya Léon Mugesera cyari kimaze imyaka n’imyaka cyarongeye kubyutswa ubu. Amakuru twahawe n’abantu babikurikiraniye hafi mu gihugu cya Canada avuga ko: Leta y’u Rwanda yashyizemo ingufu nyinshi za politiki cyane ifatanije na Lt Gen Roméo Dallaire, wahoze ayoboye ingabo za MINUAR mu Rwanda kugira ngo Léon Mugesera ashobore koherezwa mu Rwanda. Amakuru dufite yemeza ko, Leta y’u Rwanda nyuma yo kubona ko uwafatwaga ko yateguye Génocide akanayishyira mu bikorwa Colonel BEMS Théoneste Bagosora, urukiko Mpuzamahanga rwashyiriweho u Rwanda rwa Arusha rwasanze icyaha cyo gutegura Génocide kitamuhama, Leta y’u Rwanda yashatse uburyo yabona undi muntu wari ukomeye mu butegetsi bwa Perezida Habyalimana, ushobora kwemera icyaha cyo gutegura Génocide. Dore ko uwari Ministre w’Intebe Jean Kambanda yemeye icyaha cyo gutegura Génocide nyuma akisubiraho kuko ibyo bari bamwemereye urukiko rutabyubahirije (Bari bamwemereye ko bamugabanyiriza igihano, bakanafasha umuryango we) uretse ko na none Jean Kambanda ntabwo yari mu butegetsi bwa Perezida Habyalimana mbere y’itariki ya 6 Mata 1994, nta n’ubwo yari muri Gouvernement. Ibyo byatumye icyo cyaha cyo gutegura Génocide yemeye, ntabwo cyabaye ikimenyetso simusiga ku buryo budasubirwaho, bivuze ngo ibyo yemeye bijyanye n’ibyateguwe nyuma y’urupfu rwa Habyalimana bitajyanye n’ibyateguwe mbere y’urwo rupfu. 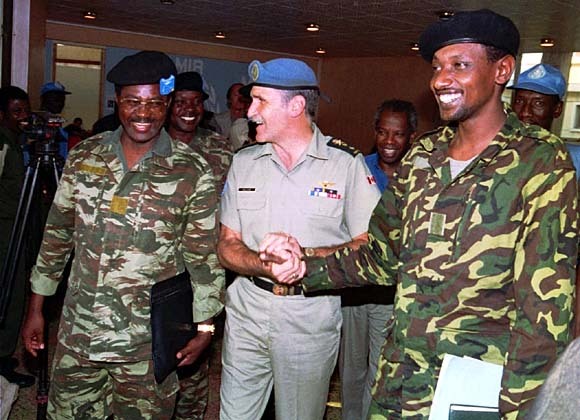 Gen Gatsinzi, Lt Gen Dallaire na Maj Gen Mugambage mu "mishyikirano"
Léon Mugesera rero Leta y’u Rwanda irashaka kumufata neza ikamwemerera kumugabanyiriza ibihano kugira ngo yemere ko igihe yavugaga ariya magambo byari nko gukopeza abaturage ibyari birimo gutegurwa, ibyo bivugwa ko azabifashwamo na mwene nyina Mfizi Christophe dore ko yitezwe mu Rwanda muri iyi minsi ya vuba niba atararangije kuhagera. Leta irashaka ikimeneyetso simusiga yerekana kuko mu rukiko rwa Arusha nta muntu n’umwe urahamwa n’icyaha cyo gutegura Génocide, ibyo bituma hakomeza kuba ishakishwa ry’ibimenyetso rirushaho rigenda rigwa ku bintu bimwe na bimwe Leta y’u Rwanda idashaka ko bimenyekana. Iki kibazo cya Léon Mugesera, Lt Gen Roméo Dallaire yakinjiyemo afatanije na Leta y’u Rwanda akoresha ingufu afite mu buyobozi bwa Canada kugira ngo Mugesera ataburanishirizwa muri Canada ahubwo azaburanishirizwe mu Rwanda aho bashobora kumushyiraho igitutu. Hazaba hari abo kumugira inama z’uko azabyifatamo nka ba Boniface Rucagu nawe wari muri iyo mitingi ya MRNDD yo ku Kabaya, bivugwa ko amagambo ya Léon Mugesera yamushimishije cyane ku buryo yakomye amashyi cyane birenze urugero! Tubibutse ko Lt Gen Roméo Dallaire ariwe wakwije hose mu mahanga ko Col BEMS Bagosora ariwe mucurabwenge wa Génocide, kuba atarahamwe icyaha cyo kuyitegura byabaye ikibazo kuri we ku buryo hakenewe Mugesera ngo yemeze ko Génocide yateguwe kuva kera ndetse anashinje Col BEMS Bagosora n’abandi. Ibi bizatuma ikibazo cy’indege ya Perezida Habyalimana kigabanya ubukana, kuko bizaba bigaragaye ko indege iyo iraswa cyangwa itaraswa Génocide yari kubaho. Ubwo uwahanuye indege ntabwo bazakomeza kumufata nk’aho ariwe watumye Génocide iba ndetse n’iyo ya FPR. Bimaze kugaragara ko ibyo Léon Mugesera yavugaga ko azakorerwa iyica rubozo bitazabaho, kuko Leta y’u Rwanda iramukeneye ngo abe ikitegererezo amahanga azareberaho yohereza abandi u Rwanda rwaba rusabye ngo baburanire mu Rwanda, kandi bigaragara ko amahanga cyane Canada azakurikiranira hafi ubuzima bwa Léon Mugesera ndetse n’urubanza rwe.